Many health officials and chefs promote the use of organic food, but what makes it any different than traditionally grown fare? In the case of organic beef, the differences are pretty remarkable. The life of an organic cow and one that lives on a conventional feedlot are worlds apart. In addition, most traditional cattle feedlots have substantial negative impacts on the environment, whereas organic ranches do not. Where Does Organic Beef Come From? According to the USDA’s Federal Regulations for the National Organic Program, farms and ranches must have a special organic certification in order to label and sell their production as organic. Meat that is labeled and marketed as organic must come from livestock that has lived under continuous organic management from the last third of gestation. Where Does Traditional Beef Come From? Most conventional beef comes from cattle that are raised on concentrated-animal feeding operations (CAFOs), sometimes called factory farms. According to "Food, Inc.," the book accompaniment to the documentary film of the same name, these are industrial-scale facilities that feed and house tens of thousands of animals in such close proximity that normal behaviors, such as grazing, cannot be carried out. Under USDA regulations, all organic livestock must be fed a diet of “agricultural products…that are organically produced and …organically handled.” This usually means that organic cattle eat grass or organically grown grains that are not sprayed with synthetic pesticides, fertilizers or other chemicals. Most cattle raised on traditional feedlots eat mainly corn and soybeans. According to Weber, cattle and other ruminants are designed to eat grass, but those that eat grains have been found to have more E. Coli bacteria in their intestinal tract and feces, which can contaminate meat with the deadly bacteria during slaughter. Unlike conventionally raised livestock, organic animals are not fed plastic pellets, formulas containing urea or manure, or slaughter by-products, as stated by the USDA. Since so many animals live so close together on CAFOs, disease can spread quickly; therefore, farmers must dose each animal with antibiotics to prevent them from getting sick. According to Walsh, increased use of antibiotics on farm animals leads to antibiotic-resistant strains of bacteria that can be passed to humans. Organic cattle don’t need antibiotics, because they don’t live in such tight quarters. USDA organic standards prohibit the use of any medical treatment given to animals unless they are sick, including antibiotics and synthetic parasiticides. Organic farmers and ranchers are also prohibited from giving their animals hormones or supplements to promote growth, as conventional feedlots often do in order to make their cattle grow faster, so that they can be slaughtered sooner, which lowers the cost of raising them. 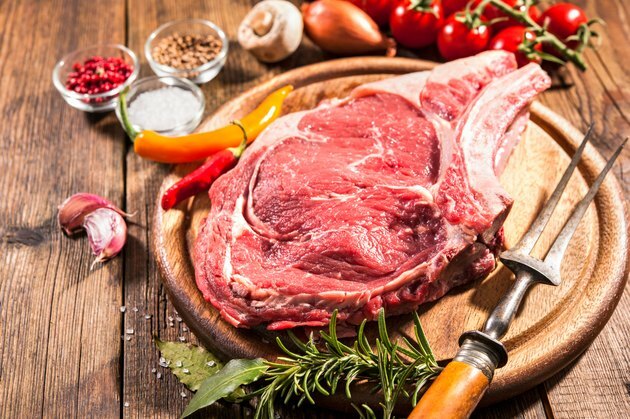 According to Weber, ingesting hormones from meat can lead to hormonal imbalances that may cause cancer. Grass from organic pastures isn’t treated with pesticides, nor is it fertilized with chemicals, but with the animals’ manure instead, thereby eliminating the problem of disposing of tons of manure produced by animals in non-organic feedlots. Walsh writes that CAFOs are detrimental to the environment because they produce millions of tons of manure that contaminates nearby water supplies, and they consume millions of tons of corn that is chemically fertilized, which produces runoff that contaminates the Gulf of Mexico and kills large amounts of sea life each year. Also, according to Weber, CAFOs can’t possibly process the enormous amounts of waste produced by thousands of animals, so they collect manure in cesspools and spray it onto the land, which can cause health problems for facility workers and neighbors, as well as potentially contaminate vegetable crops with E. Coli bacteria present in the manure. Is Organic Beef Worth the Cost? Because of the efficiency of CAFOs as well as government subsidies, millions of pounds of meat can be produced quickly and cheaply, making hamburgers cheaper than whole grains and fresh vegetables, which contributes to the increasing obesity epidemic. Organic, grass-fed meat, however, is higher in Omega-3 fatty acids--which can lower cholesterol--beta-carotene and vitamin E. Unfortunately, organic meat costs much more than conventional meat, because it is more expensive to produce since organic ranchers can’t raise as many cattle per acre as CAFOs. But Walsh writes that the long-term cost to our bodies and our planet far outweighs the extra dollars we dole out at the supermarket.